A friend at work. I was filling in for a woman on maternity leave for the last 3 months, sitting close to the team she managed and helping them to the best of my ability while she was gone. She came back to work on Monday. It has been tough for her, but I LOVE that she is back. She is funny and smart and kind and it is so great to sit next to her and laugh a bit through my day. Minis given and received. 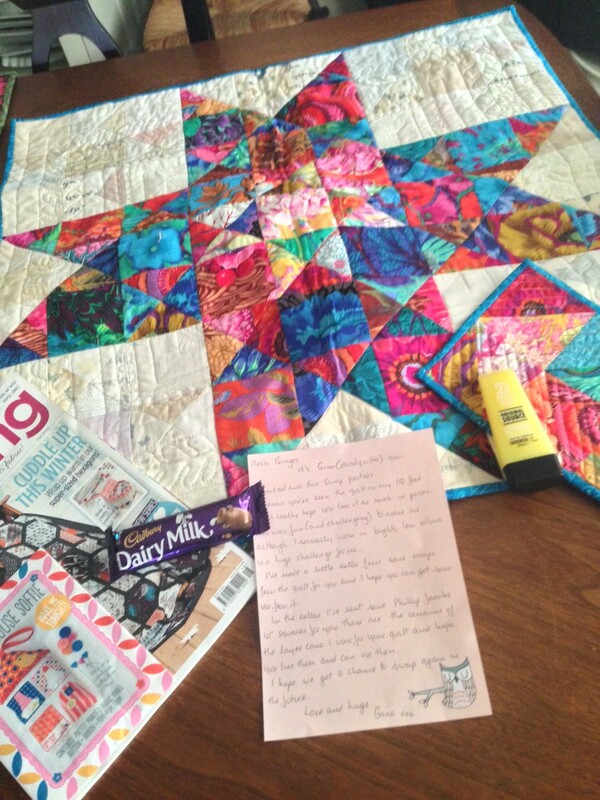 The Schnitzel and Boo Mini Quilt Swap ended this week. My partner loved her mini. And my goodness, did I love the one I received. All the way from Wales. It is so full of color and skill. Just amazing. I think it is going to live on my dining room table. A sailboat and a friend. I had dinner with a friend that I haven’t seen in a while. She is also samrt, funny, and kind – and the type of person that invites opening up and sharing without judging. It was so good to talk to her about what is going on in my world. She is a great listener and was very encouraging. 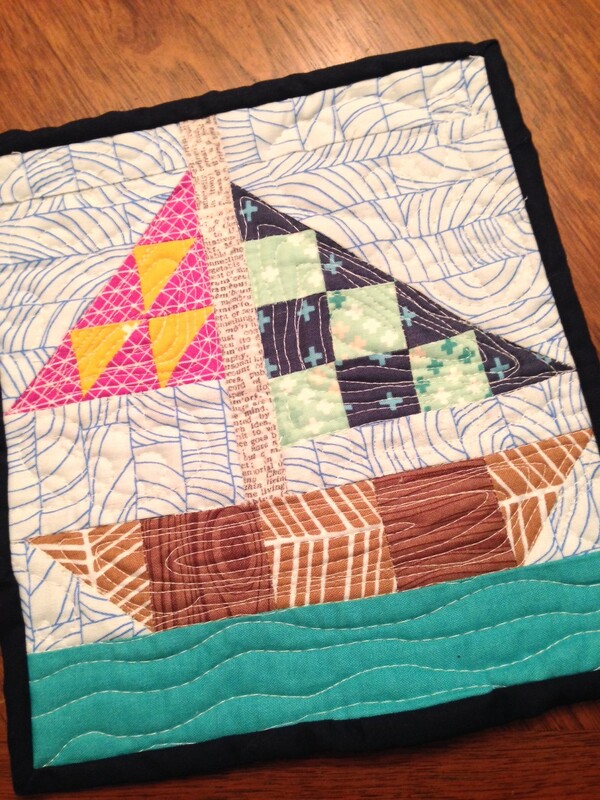 AND I made her this adorable sailboat mini because she loves sailboats. And she loved the mini. She gushed and I was happy. I love making things for people. I have to be careful, totally like crack for me. Oranges. I had a couple of really great oranges this week. I don’t completely understand why January is citrus season, but I am enjoying it. I love oranges, but often the mess is not worth the taste. Not this week. Those oranges were off the hizzle. Turning my frown upside down. Thursday morning I woke up late and miserable. I felt absolutely hideous and tired and hateful. And I still can’t find my favorite shirt. I came downstairs and my husband provided the perfect mix of sympathy and humor and support and I felt better. What a frickin’ gift that is. And this morning I woke up not miserable at all. Thinking about my stepson’s quilt. I currently am in progress of making my stepdaughter a quilt. 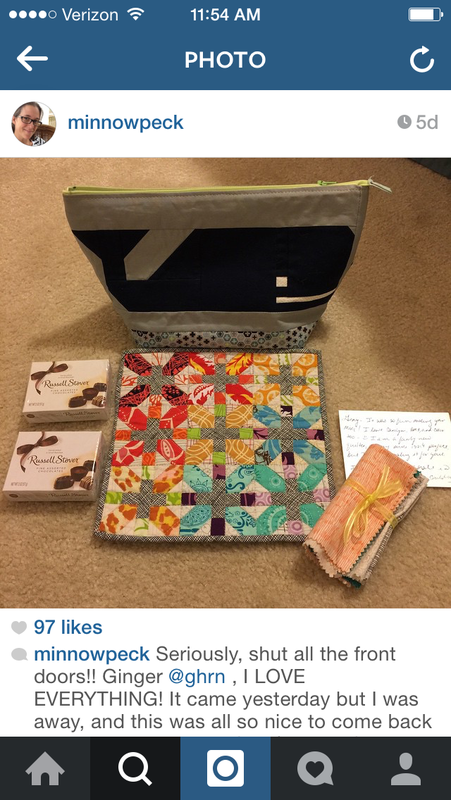 I have a long way to go, but I have started to think about the quilt I will make my stepson. I think he would love licensed sci-fi stuff – but I am thinking I will avoid that. My stepkids turn 14 in a few weeks, and so these quilts could go to college with them. I want something that will stand that test of time. I think I have landed on making a quilt using the Doe line. It is just absolutely awesome, masculine, quirky patterns in great colors. Now I just need to figure out which pattern.